it is a clawless hallux. The footpads, which may be placed on the ground when standing or moving slowly, extend to the heel and wrist joints. There are four upper and three lower incisors, two premolars, and four molars, each of which is similar in form and has distinct cusps with both slicing (carnas-sial) and grinding surfaces (less so in highly carnivorous forms such as the Tasmanian devil, Sarcophilus laniarius). Across the considerable size range (from the 0.14 oz [4 g] Planigale in-grami, the world's smallest marsupial, to the 28.6 lb [13 kg] devil), body shape is remarkably uniform. Arboreal species tend to have broader hind feet than terrestrial species, and a more prominent, dexterous hallux. One sandy desert species has fine bristles on the footpads. 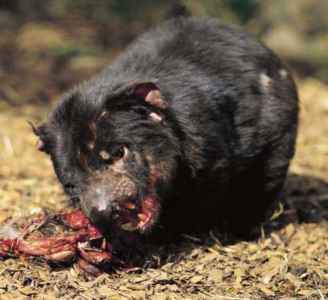 The most extreme variations in morphology include Antechinomys laniger, which has elongated hind legs and a bounding gait, and the heavily built, specialist scavenger, the Tasmanian devil, with massive skull, teeth, and jaw musculature. Coat color is mostly uniform shades of gray, sandy to reddish to dark brown, or black, sometimes with a lighter underbelly. Striking markings are the province of the larger dasyurids, with white spots on quolls and white markings in the devil, although six New Guinean dasyures (three Murexia, one Myoictis, and at least one Phas-colosorex) have dark dorsal stripes, and two diurnal species have speckled (speckled dasyure, Neophascogale lorentzii) or grizzled (dibbler, Parantechinus spp.) gray fur, all of which may serve as camouflage. 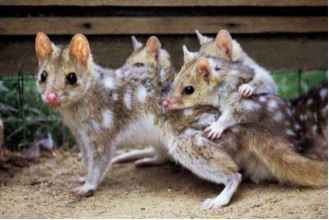 Some desert dasyurids have very sparse fine tail hair, the smaller quolls have soft, fluffy tails, while others are finely tufted at the tip, or sport a highly visible black bushy brush that contrasts with the pale body fur. Tail fur may function as flags in communication. Some species, notably the fat-tailed pseudantechinus (Pseudantechinus macdonnellensis), the fat-tailed dunnart (Sminthopsis crassicaudata), and the Tasmanian devil, store quantities of fat in their tail when environmental conditions are good, leading to a distinctly parsnip-shaped tail. The pouch is either well developed (though still quite shallow compared with diprotodont marsupials) as well as backwards facing, or it is almost absent (raised lateral ridges of skin) and downward facing. Teat number varies from four to 12 and may vary within species. 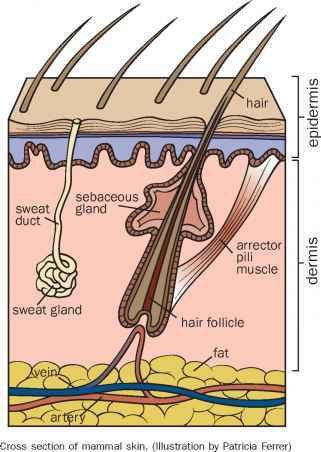 Male Tasmanian devils have a shallow scrotal pouch.